Nine students representing UBC medicine, midwifery and pharmacy along with licensed practical nursing (Vancouver Island University), respiratory therapy (Thompson Rivers University), and optometry (University of Waterloo) participated in this year’s week-long trek to Grand Forks, Trail and Nelson. The roadshow is an eye-opening experience for countless high school students, who discovered that thumbs have pulses, and babies turn during birth. Many are surprised to learn about the existence of midwives and respiratory therapists and the scope of practice each profession represents. In total, more than 600 students from Grand Forks Secondary School, JL Crowe secondary in Trail, and LV Rogers secondary in Nelson participated in the travelling exhibition. As part of the trip, the university students had an opportunity to explore each community, tour local healthcare facilities to speak with rural practitioners, and connect with local mayors and councils. The healthcare travelling roadshow was conceived and developed by Dr. Sean Maurice at the Northern Medical Program, based at the University of Northern BC. The provincial initiative is sustained by support from the Northern Medical Programs Trust, Rural Education Action Plan, Interior Health and UBC Southern Medical Program. The program has grown to include three regional trips this year including Kootenay (Grand Forks, Trail, Nelson), Cariboo (Quesnel, Williams Lake, 100 Mile House) and Robson (McBride, Valemount, Clearwater and Barriere). Since its inception, the roadshow has connected with more than 7,000 teenagers in 32 communities throughout BC. 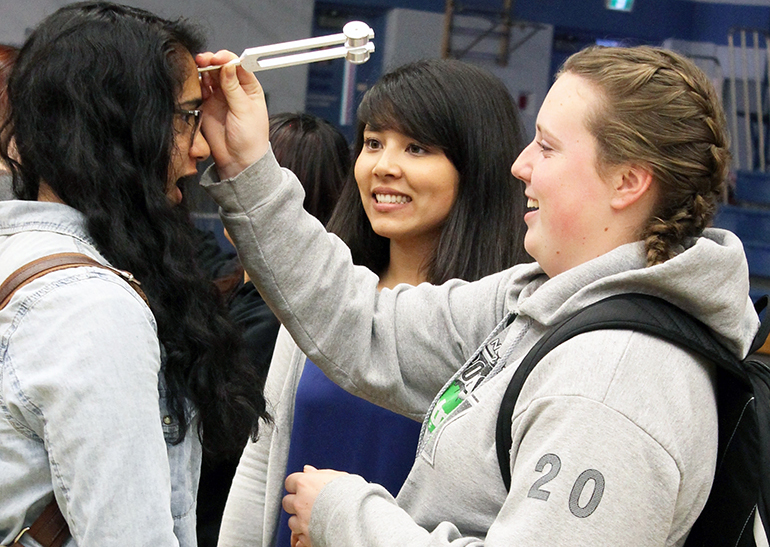 First-year UBC medical student Stephanie Schindler (middle) leads hands-on activity for students at LV Rogers Secondary in Nelson as part of the Healthcare Travelling Roadshow.